The powerful and critically-acclaimed story of Jesus told in a strikingly beautiful visual style. Stars Oscar-nominees and Emmy-winner Rip Torn (TV's "The Larry Sanders Show") as Judas and Robert Ryan ("Bad Day at Black Rock," "Crossfire," "The Wild Bunch") as John the Baptist with Jeffrey Hunter ("A Kiss Before Dying") as Christ. Directed by Oscar-nominee Nicholas Ray ("Rebel Without a Cause," "In a Lonely Place"). Narrated by Orson Welles ("Citizen Kane"). "...grandly filmed...deeply moving" - Leonard Maltin. Director Nicholas Ray has brooded long and wisely upon the meaning of his meanings, has planted plenty of symbols along the path, yet avoided the banalities of religious calendar art. And there are moments within King of Kings that are quite beautiful and striking , deliberately intended to stand out from the norm. Because the makers of King of Kings took a chance by casting heartthrob Jeffrey Hunter as Christ, this was quickly dubbed by industry wags I Was a Teenage Jesus. But the film is far better than that label would suggest. Nicholas Ray's biblical epic, toward the end of his career, is an intelligent film that finds the right balance between exteriors and interiors, stunning vistas and compelling characters. 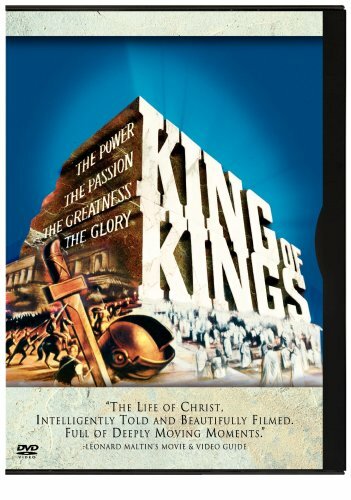 Nicholas Ray's King of Kings is an extreme test of one's patience, a sluggish modernist power point presentation on the glorious influence of Jesus's greatest hits. ... whereas detractors dismissed the films as I Was a Teenage Jesus, it's more accurate to describe it as Rebel With a Cause. Although it may rely a little too heavily on spectacle, it features fine acting, direction, and photography. On Blu-ray it makes a splendid showing. Jeffrey Hunter is less Saviour of the Christian faith and more anti-hero with many very human doubts and concerns. An epic of considerable scope, filled with broad vistas, yet there are enough intimate moments to give audience a chance to engage with the characters rather than just admire their pontificating. A sweeping and at times stirring biblical epic.